As a guitar teacher, I see a lot of common mistakes in my beginner students. While it’s okay to have lofty goals and aspirations, all too often, beginner students get discouraged early on by not being able to achieve the tone, smoothness, and power of famous guitarists like Jimi Hendrix and Eric Clapton on electric guitar. Not only is this pretty unrealistic and unhealthy to hold oneself up to such standards, but it’s also indicative of a few underlying misconceptions about learning to play the instrument in any style, especially when you’re coming from acoustic. 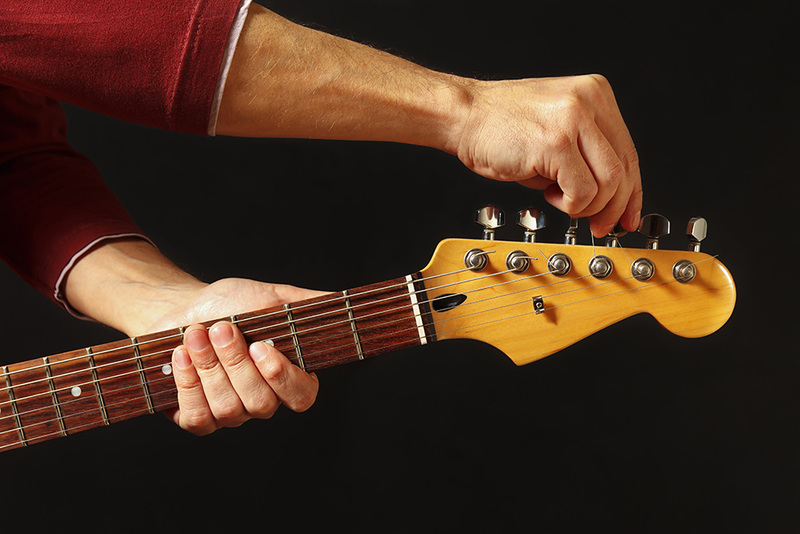 Here are some of the common mistakes people make when learning to play electric. Wanting to play as quickly as Eddie Van Halen is natural. Often, that’s why many of us pick up the guitar in the first place; we want to sound like the greats. It’s important to remember, however, that those legendary guitarists didn’t simply pick up those skills overnight. Instead, they had to practice for endless hours to achieve that level of mastery, despite any natural talent. When you’re learning electric guitar, make sure you’re using the correct fingerings for each note and move around the fretboard in the most convenient possible way, establishing good technique in the process. As you learn to play melodic passages, challenge yourself to gradually increase your speed as you play them. If you’re consistently getting stuck at the same place in your run of notes, try to find an alternate way to play that particular part that might be faster. It’s okay to associate this instrument with that heavy, power-driven, rock-and-roll sound. But loudness can come from so many other places than how hard you hit the guitar strings with your pick! In fact, strumming violently often leads to pretty painful and disorienting cuts on your fingers. It’s important to learn to strum in a balanced way. Strumming guitar strings too hard creates unbalanced bass tones (since those are the first stricken and therefore absorb the majority of your force) and next to no mid or treble tones. Using certain guitar pedals and, of course, an amplifier, means you don’t necessarily need to strum as hard as you want the strings to sound. Take the time to learn how hard you’ll need to strum to create a sound suitable for your style while still allowing all of the pitches in a chord to ring through. Tuning your guitar can seem tedious and feel pointless when you’re in the practice room by yourself without other instruments present. Yet, this is actually one of the most important habits you should form when learning the electric guitar. Consistently playing an untuned guitar, or with variably tuned pitches, makes it difficult to internalize the sound of the “correct” pitch for each string, and you’ll grow accustomed to the out-of-tune sound. Guitarists need to train themselves to hear their strings resonate at the proper frequency. Additionally, creating the habit of tuning your guitar is important because it’s often easy to forget this step when you’re onstage and feeling a bit nervous. Many beginners, having just entered the spotlight for the first time, begin playing immediately and forget to ensure their guitar is sounding its best. + Learn more on Soundfly: Leave standard behind, and explore alternate guitar tunings with Soundfly’s new series of bite-sized courses, Alternate Tunings for the Creative Guitarist! If you’ve ever watched videos of some of your favorite blues and rock guitarists, many times, they’re sitting hunched, or slouching, or standing while bending over their guitar like the Hunchback of Notre-Dame! Good posture is important for two main reasons. First, it will actually improve your technique in the long run. Past guitarists have endlessly experimented with different ways of holding the guitar and determined the optimal way to create clear, pristine sounds. Second, having good posture will prevent physical injuries in the future. Classical guitarists actually study posture and train their bodies as they train their technique. Too often, though, electric guitarists slouch over their guitars, developing poor technique and, eventually, bad spinal health. Other guitarists can harm their wrists by holding the guitar in a way that’s unnatural for the human body. If you plan on playing guitar for a long time into the future, teach yourself to play in a way that’s sustainable. Since the electric guitar is associated with rock music, and rock music is associated with overdriven heaviness, it’s natural in both a recording setting and live onstage that you’d want to turn up the juice in the middle of a song to give it that extra umph! Well, guess what? Sound and recording engineers hate that. Whether you’re in the studio or standing onstage, soundcheck and setup are the times you should be messing with the settings on your amp and what’s especially important: establishing your loudest signal. This way, your sound person will be able to plan accordingly when you hit the boost and overdrive pedal and let the signal soar! Avoid acting on the feeling that you’re not loud enough and turning the amp up at all costs. For greater control over your sound and tone, learn about all the types of guitar pedals and start putting together a pedalboard that reflects the guitar sound you’re comfortable exploring at greater depths. It’s tempting to practice what we’re good at over and over again. Playing pieces or songs that we’re familiar with boosts our confidence. Even though it’s tempting to play what you know, remember that it’s more important to learn to play what you don’t. Expanding your repertoire and technique will come from expanding what you’re playing. Remember that growing as a musician comes from the discomfort of playing new material. Embrace that discomfort, and you’ll be sure to see results. For a bit of inspiration on how to get the most out of your practice every time, check out our short interview series called How Successful Musicians Practice. Practicing on your own is a great way to get to the nitty-gritty parts of a piece or song. When you have to repeat two bars of music over and over again until you feel like you’ve played it a thousand times, it’s best to do so on your own so you don’t drive the other people around you crazy. Intense, solitary practice can also help you get better at playing without looking. But when you have a piece performance-ready (which means you can play the piece through without having to repeatedly stop to fix mistakes), it’s best to practice in front of an audience. Practicing in front of other people, whether at an open mic, in someone’s living room, or on a national tour, allows you to become better accustomed to sharing your music, hones your performative instincts, and helps you develop quicker reactions on your instrument. The musicians with the worst performance anxiety are typically the musicians who only play in private. When you finally have a piece or song ready to perform, you need to make sure you can play it at a consistent tempo. You’ll probably be able to master certain parts of a piece without any problems, but you might struggle with harder passages. When playing the song straight through, you’ll naturally slow down through the more difficult parts. Doubling down and practicing through these harder passages at the correct tempo is a great way to ensure your ability to perform a song from beginning to end properly. Pick up a metronome if you want to really tackle this problem. As an audience member, it’s better to hear a piece played slowly and consistently rather than quickly at some parts and slowly at other parts. Music is about the overall impression, not always the speed. Avoiding learning at least a beginner’s level of music theory and how to read music is a classic mistake many beginner electric guitarists make. Theory allows you to excel onstage even when your memory slips, improvise, and create memorable variations of existing songs. It’s important to understand the basic foundations of how chords are formed and fit into progressions, how intervals relate to each other and create different scale modes, and how to use inversions to troubleshoot different chord shapes. Additionally, learning scales used in different styles of music allows you to become a versatile musician who can operate in any genre. Remember to create basic habits, such as tuning your guitar and adopting a sustainable posture. Taking things slow, building a solid foundation, learning how to read music, and playing consistently will also help you become the best musician possible. Enjoy these tips, and have fun! Hi there! My name’s Natalie Wilson, and I believe that music should be enjoyed by everyone. I started a blog called Musical Advisors to share my knowledge about being a musician. On my blog, you’ll find instrument reviews, tutorials, the latest on music technology, and more! You can read my latest post here.